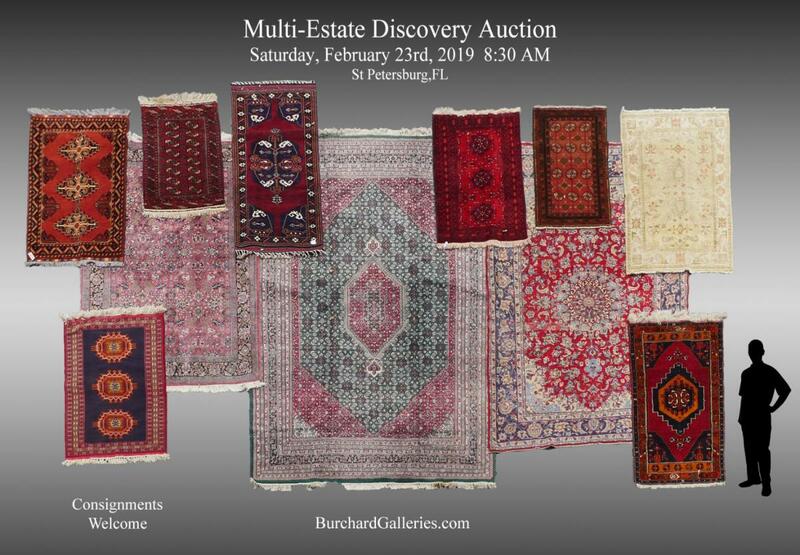 Marathon Multi-Estate Discovery Auction Saturday February 23rd, 2019 @ 8:30 AM Preview: Saturday, 2/23	8:00 AM Shop the Best Kept Secret in St. Petersburg… SAVE THE DATE! A Must-See Event! Featuring a stellar assortment of vintage Estate Antiques, Artwork, Jewelry, Pottery, & More much of which will be arriving at the gallery right on up to Auction Day. In addition to our normal array of spectacular items shown all at No Reserves! ALSO.. Oriental Furniture; Carved Oak Sideboards; Cloisonne; Chippendale Chairs; 6 Crane Chinese Table; Eastlake Loveseat; French Fauteuils; Large Oak Scottish Chest; Old Books, Pennsylvania Railroad Memorabilia; Cross Pen Collection; Vintage Slag Glass and Reverse Painted Lamps; Waterford; Many Rare Old Clocks; Lladros; Large Lot of Loose Gemstones, 200+, Sold in Lots; Much Miscellaneous Sterling; Diamond and Gemstone Jewelry and LOADS Vintage Costume Jewelry! An Amazing Auction you won’t want to miss! Also, 100+ Quality Works of Art: Oils, WCs, Prints & Etchings, Lithographs, Woodcuts: American Etching Lots; Architectural Prints; Burmese Kalaga; Japanese Art on Silk; All selling at NO Reserves. Check Auctionzip.com. These Estates Must Be Sold! NOTE: If we do not have your email address, please send it to mail@burchardgalleries.com to receive the latest updates. It’s going to be another GREAT DAY AT THE AUCTION! See You There!! Calling all E-Bayers! This is “THE PLACE TO BUY! !